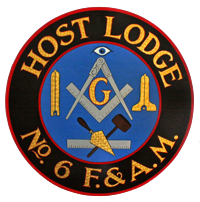 Uncategorized – Host Lodge #6 F. & A.M. Your Admin has been remiss in posting to this page. Since the last post in August, an entire month has passed! Hosted the month’s DLI, with an informative presentation by RW Mike Holt, Grand Orator, and RW Gary Olsen, DDGM of the 17th Masonic District. There is more to come in October! Please be aware that every Wednesday that is not a regular communication, there will be ritual rehearsal at the Lodge. All officers should attend, especially the 2018 officers. If you cannot attend, please let the WM or SW know. A Good Day in Trenton! On Saturday, May 13, Host Lodge, along with the rest of the 14th Masonic District, participated in the second ” Super” Grand Lodge of Instruction (GLI) at the Grand Lodge building in Trenton. The 14th was paired with the 22nd district, out of Salem & Cumberland counties. It was a good day of ritual and fellowship. Those who participated are looking forward to next year. Congratulations to Brothers Brands, LoBiondo, and Weidner on being passed to the degree of Fellowcraft. Soon we will have three new Master Masons! Brethren! The next few weeks will be busy for our Lodge. On April 26, at an emergent communication, we will be conferring the Fellowcraft Degree at Host Lodge. The following week, on May 3, we will be initiating two candidates at our annual visit to the Old Trenton Masonic Temple. Please come out and support your officers, and welcome our newly initiated and Passed brothers. Congratulations to Brothers Entered Apprentice Brands, LoBiondo, and Weidner on their initiation in February. They are well on their way to being passed to Fellowcraft very soon.